We guarantee that every serving of PROMAX provides 25g of high-quality biomax Whey True Protein to help support the growth and maintenance of muscle. To develop or increase muscle mass you need more protein in your daily diet. 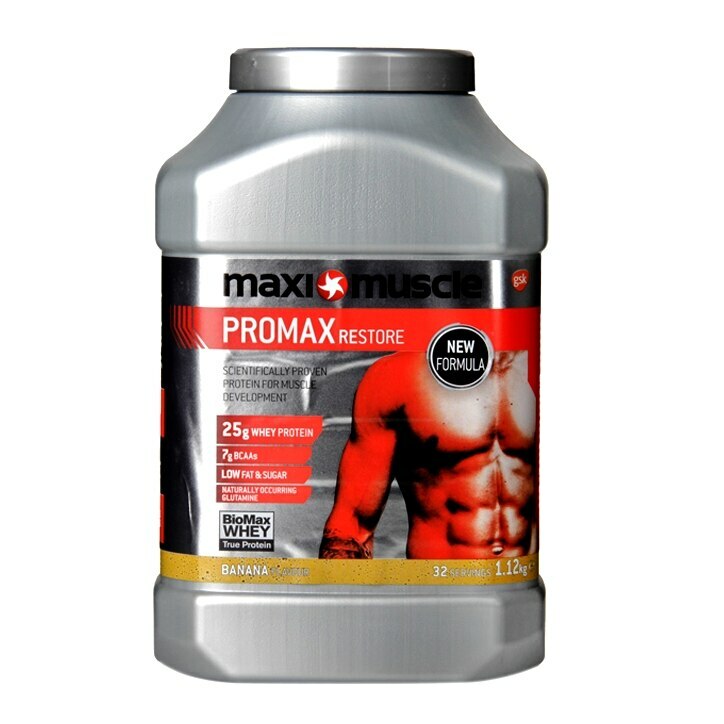 PROMAX is a low fat, low sugar, protein-rich shake containing 7g naturally occurring Branched Chain Amino Acids (bcaas) and naturally occurring glutamine. Benefits OF promaxbcaas & Glutamine: Maximuscle’s PROMAX protein formula naturally provides 7g of the Branched Chain Amino Acids (Leucine, Isoleucine and Valine) in every serving. Bcaas are considered essential amino acids as the body cannot produce them itself and are required in our diets. Every serving also contains naturally occurring glutamine, the most abundant amino acid in the muscle. Every serving of PROMAX is low in fat, sugar and salt. Magnesium: Every serving of PROMAX contains a source of magnesium, which contributes to muscle function and reducing tiredness and fatigue. Screened and effective: Every batch of PROMAX is screened for banned substances and is registered with the Informed-Sport programme. For one serving, add one scoop of powder ( 35 g) to 200 ml of water, shake to blend and enjoy! BioMax Whey True Protein (97%) (whey protein concentrate (milk), whey protein isolate (milk), hydrolysed whey protein (milk)) ,flavourings , magnesium citrate , colour ( curcumin ), thickener ( cellulose gum ), sweeteners ( sucralose , acesulfame K ). Food supplements should not be used as a substitute for a varied and balanced diet and a healthy lifestyle. Do not exceed the recommended daily intake. Keep out of reach of children. MaxiMuscle Promax Powder Banana is rated 4.5 out of 5 by 4. Rated 5 out of 5 by Grubsy24 from Tastes great with skimmed milk. This is my second purchase of this product. It mixes really well with milk and tastes just like a banana milkshake. I have a double serving after training and this really helps with my recovery. Rated 4 out of 5 by Anonymous from Nice taste and quite good effects Bought this product some time ago and I'm really please. I can see my body develop nicely and I like the flavour. No problems with my sensitive stomach.